An absolutely mesmerising nail polish which actually distracts me throughout the day when I wear it (no seriously it does...I find myself just waggling my fingers and smiling) and results in dozens of compliments. 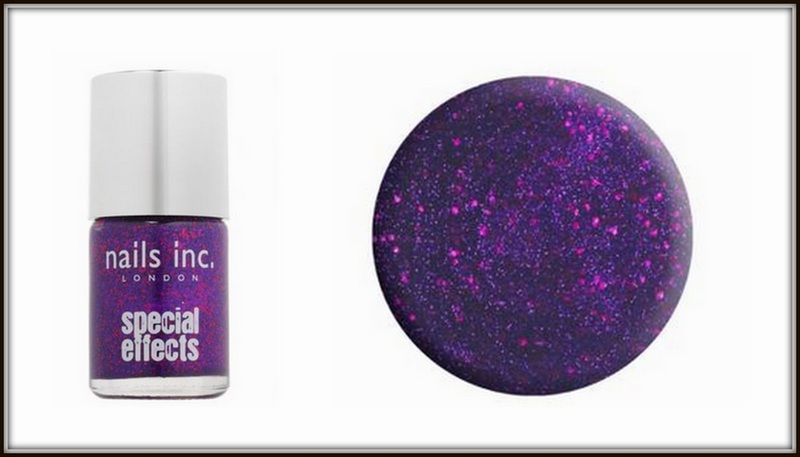 it is described as a 3D glitter polish and this one has a purple base with light reflecting red glitter particles which look completely different depending on the light. The swatch below reminds me of some sort of cosmic-space-inspired-galaxy colour! You need 2-3 coats in order to achieve a solid all-over colour or you can apply over other nail varnishes for lots of different effects. If you don't want the attention-seeking-obnoxiousness on all ten fingers then definitely whack this one out when you're feeling an accent nail! It dries quickly and doesn't smudge but can be a bit of a nightmare to remove. It's £11 from nails inc.